Our dreams speak to us in a language all of us can learn. Eloquently written by the dream specialist of our age, Appreciating Dreams develops a comprehensive technique for exploring dreams in small group settings. The shared trust and safety of a group structure can stimulate creativity and imagination and help the dreamer find her or his way into the dream. This approach to understanding dreams shows how natural and effective dream work with groups can be. It is always exciting to help the dreamer hear what the dream is saying in its own true voice. "In Appreciating Dreams, Ullman continues to empower the dreamer, providing detailed instructions for laypeople who are motivated by a quest for mutual growth and self-understanding." - Stanley Krippner, Ph.D., Saybrook Institute "Appreciating Dreams makes available to people, not just patients, a supportive, protected method for establishing a living contact with our valuable inner experiences." - Milton Kramer, M.D., University of Cincinnati "Appreciating Dreams is a wonderful book. 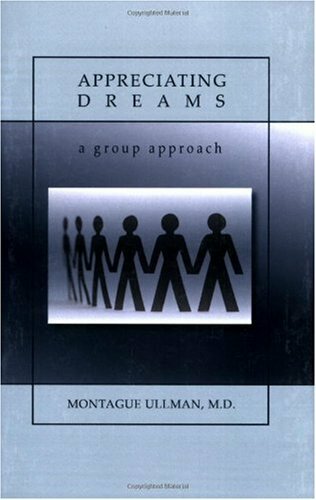 It is a complete handbook for dream group leaders and for anyone interested in working with dreams in a group." - Ernest Hartmann, M.D., Tufts University AUTHOR (or ORGANIZATION) BLURB [to appear on back cover]: MONTAGUE ULLMAN, M.D., is a New Yorker who attended Townsend Harris Hall, the City College of New York, and New York University School of Medicine, where he received his medical degree in 1938. Following his internship and residencies in neurology and psychiatry, he served as a captain in the army medical corps both here and abroad from 1942 to 1945. A graduate of the Comprehensive Course in Psychoanalysis at the New York Medical College, he became a member of the faculty there in 1950. In 1961, he left private practice to head a department of psychiatry at the Maimonides Medical Center in Brooklyn. His interest in preventive psychiatry led to the opening of the first fully operational community mental health centers in New York City in 1967. His research interest led to the establishment of a sleep laboratory devoted to the exploration of the paranormal dream. Dr. Ullman is a Charter Fellow of the American Academy of Psychoanalysis and is currently Clinical Professor Emeritus, Department of Psychiatry at the Albert Einstein College of Medicine. Dr. Ullman has written numerous papers on the neuro-physiological, clinical, and social aspects of dreams and is the author and coauthor of several books, including Dream Telepathy (1988) and Working With Dreams (1979), and is coeditor of the Handbook of States of Consciousness (1986) and The Variety of Dream Experience (1988).